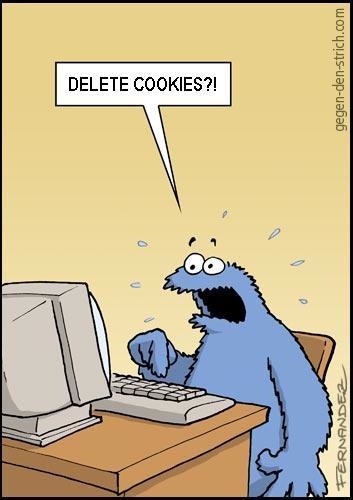 dessert.philipp-soehnlein.de » Cookie Monster No Want To Delete Cookies? This entry was written by Phil and posted on April 29, 2009 at 6:27 pm and filed under Photo. Bookmark the permalink. Follow any comments here with the RSS feed for this post. Post a comment or leave a trackback: Trackback URL. Concerning cookie links: I also liked http://laughingsquid.com/twitter-cookies/ – “Umlauts are grillz for vowels” – Americans just don’t get “ä ö ü”. Plus “Umlauts” make me think of Lorelai. Lorelai: I cannot believe you just called me Umlauts! Jason: You called me Digger three time before I called you Umlauts. I think that shows amazing self-control! Oh, indeed. I never got that. And I think my brain has a filter, which redirects all Jason related dialogs to /dev/shorttermmemory, because I never liked the story arc with him. Honestly, I don’t remember him at all, apart from this snippet of dialog… strange, huh?